Explore the beauty of the land of Lamas! The sights of the picturesque lake from the Aamir Khan movie 3 Idiots is etched in our mind vividly and it’s none other than the Pangong Tso lake from Ladakh which stretches across the Indo-Bhutan border. Despite the administration’s rules against boating in the lake, you can ice skate at the edge of the frozen lake in winters. Apparently, popular as the highest motorable road, Khardungla Pass is well known amidst adrenaline junkie circles due to the travel being aptly named ‘adventure of a lifetime’. Zanskar River, like the beauty of Ladakh, is evergreen! During summers, the river offers one of the best rafting experiences in India whereas in winters, the frozen translucent river hosts travelers for the Chadar trek usually done in November. Ladakh houses not only beautiful terrains but also exemplary people and enchanting architecture in the form of monasteries. Some of the popular monasteries that sway you with their charm are the Spituk Gompa monastery, sitting atop of a hill like the cherry on top of a cake; the Namgyal Monastery which has hosted the Dalai Lama himself; the Hemis Monastery; the Lamayuru Monastery where star-gazing is a thing; Likir Monastery, and more. The once royal abode of the Namgyal King, the 9 storeyed Leh Palace now lies in ruins. 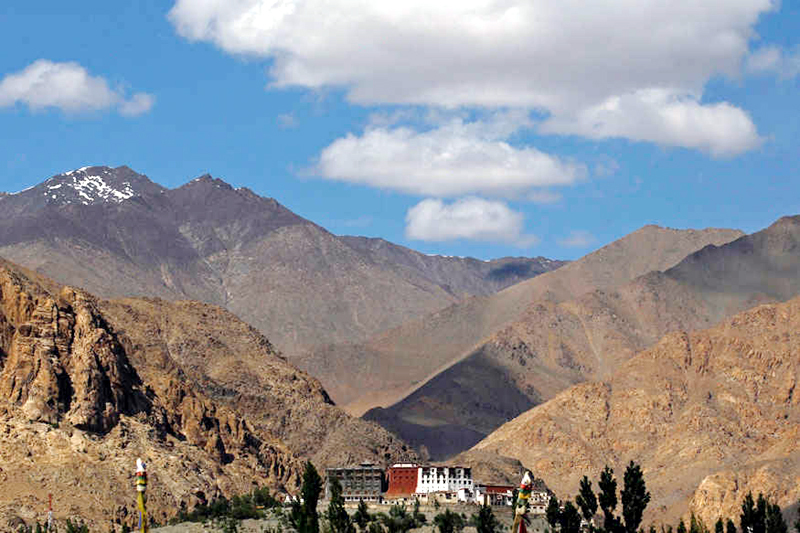 Built in the 17th century, the historic architecture of the Leh Palace is something to watch out for and the Stok Kangru and Zanskar ranges that surround the place are also a sight to behold. The flora and fauna in Ladakh is rare and unique, which makes a visit to the zoo mandatory. The place has preserved the flora and fauna well and a snow leopard is one of the most beautiful creatures found in this area. A bike trip across Ladakh is on the bucket list of zillions from around the world. Bikes can easily be rented here, however, avoid the monsoon season as during this time there is a high occurrence of landslides which leads to long traffic jams in the area where traffic is just stranded and despite best efforts by the administration, the road takes hours to clear up. Despite having seen these in the Tibetan markets in your city, this is your chance to buy the most authentic Tibetan handicrafts, Pashmeena shawls, knit garments, etc. and also getting some of most beautiful souvenirs for your loved ones. Another mesmerizing site in Ladakh is the Tso Moriri Lake. The tranquil blue lake stands iconically amidst the snow clad mountains and vast blue sky. For all the foodies, Ladakhi cuisine is neither same as the Kashmiri cuisine nor consists of only momos, so here is your chance to experience the local culture and traditions of the people and getting your hands on the delicacies in Ladakh.